I can still remember the song "London bridge is falling down". I used to sing this song when I was a child. 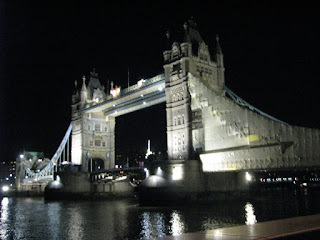 I was delighted after knowing that London bridge is not really the bridge that is falling down. I mean, the bridge that is suspending. It is actually named as the Tower Bridge. Don't be confused with London Bridge and Tower bridge. They are totally different. Here is the right bridge that fit the song I mentioned above. I would then say, "Tower bridge is falling down". The tower bridge crosses the River Thames in London, England. It is 244 meters long and with a span of 61 meters. Its construction started in 1886 and was opened in June 30, 1894. The bridge connects The Borough (Southwark, south of the river, left of picture) to the heart of the City of London Financial District. I took this photo during my visit with a friend last Oct. 2008.